(Nanowerk News) Prof. Yuanhua Shao’s group at the Beijing National Laboratory for Molecular Sciences have recently studied the kinetics of several ion transfer (IT) reactions at the water/1,2-dichloroethane (W/DCE) interface by nanopipette voltammetry collaborated with Prof. Hubert H. Girault (EPFL, Switzerland). This work is important in understanding the mechanism of IT processes at soft interfaces, chemical analysis and biological sensing on the molecular scale (Angew. Chem. Int. Ed., 2009, 48, 43, 8010-8013). The kinetics of IT reactions at liquid/liquid interfaces has been the central focus in the past few decades, and is often very fast and difficult to measure. Many electrochemical methods including chronocoulometry, a.c. impedance, and cyclic voltammetry have been extensively used to probe kinetics of IT processes. Unfortunately, measurements by these conventional electrochemical methods at macroscopic (e.g., mm-sized) liquid/liquid interface are easily affected by uncompensated ohmic potential drop (iR-drop), capacitive currents and deficient mass-transport rate. To minimize those effects, Girault et al. introduced in 1986 a micro-sized liquid/liquid (µ-L/L) interface supported at the tip of a pulled glass micropipette and in 1997 Shao et al. further reduced the liquid/liquid interface to the nanometer-range using nanopipettes. 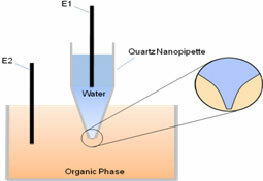 Nanopipette voltammetry and scanning electrochemical microscopy (SECM) are currently the most reliable techniques which can be used to extract the fast kinetic rate constants of IT reactions at a liquid/liquid interface. The fastest rate constants reported so far are in the range of a few cm/s. (A - left) Schematic representation of the experimental setup. (B - right) Background-subtracted cyclic voltammogram of TEA+ transfer across the nano-W/DCE interface supported at a nanopipette. The configuration of the experimental setup is illustrated in Figure A. We employ nanopipettes with r less than 5 nm (which has never been reported) for the kinetic study in this work. Because nanopipettes are insulator and hard to be characterized by SEM, the empirical equation proposed by Girault et al. is utilized to characterize the nanopipettes using facilitated ion transfer (FIT) of potassium by dibenzo-18-crown-6 (DB18C6) at a W/DCE interface. 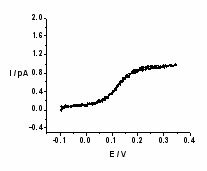 By optimization of experimental conditions and background subtraction, well-defined steady state voltammograms for the transfers of TEA+ (Figure B), ClO4–, and FIT of K+ by DB18C6 could be obtained. Based on the three-point method developed by Bard and Mirkin, the kinetic parameters can be extracted. The mean values of k0 and charge transfer coefficient?? ?of three IT reactions are 110 ± 23.2, 94.9 ± 30.6, 27.1 ± 6.4 cm s-1 and 0.57 ± 0.08, 0.56 ± 0.13, 0.65 ± 0.09, respectively. These values are the highest rate constants reported so far for charge processes at a liquid/liquid interface.